Kapil Sharma and Ginni Chatrath will soon give their third wedding reception. This reception will be held in Delhi on February 2. A few days ago, Kapil Sharma met PM Modi during a program in Mumbai. It was only after this meeting that it was revealed that Kapil would give another reception. Now the cards of Kapil’s reception have come out. Kapil Sharma and Ginni Chatrath were tied their wedding knot on December 12-13. 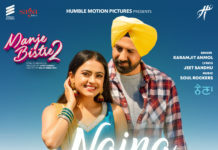 After this, a reception party was held in Amritsar on December 14, and on 24th December the party was given especially for Bollywood Celebs. Many big stars including Ranveer Singh, Deepika Padukone and Rekha were involved in this party. In this party, Ranveer-Deepika had a lot of fun with Kapil and Ginni. 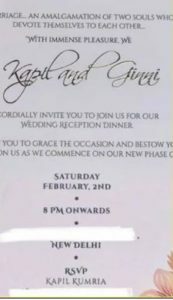 On February 2, this reception of Kapil and Ginni in Delhi will include family members and close relatives. With this, some big leaders and bureaucrats in the party will also be guests. It is reported that Kapil has also sent a special invitation to PM Modi and requested him to join the party. According to reports, PM Modi can also join Kapil’s reception. The cards that were sent to the guests have been invited for dinner. Although this reception will be held in Delhi. The name of the place hasn’t mentioned on the card. These days Kapil Sharma is busy with his show named ‘The Kapil Sharma Show’. Since Kapil has made a comeback on TV, everyone’s eyes were on TRP rating. Unlike expectations, the audience has been disappointed with the Kapil Sharma show. Along with the critics, the viewer gave it a mixed response. The show is facing deterioration due to Kapil’s presence in the tap cast. Last week, Kapil’s show was at number three, while the number two slipped to the fifth position. kapil Sharma and Ginni Chathrath.